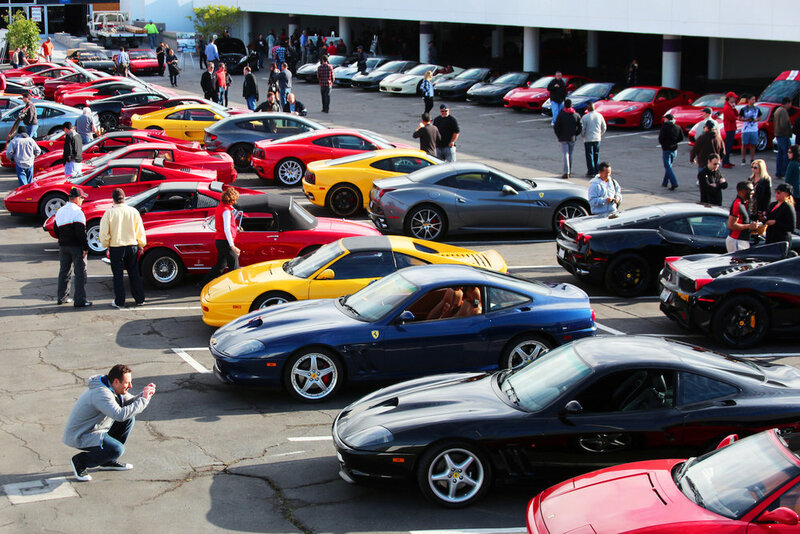 On a rainy morning in February, Ferrari owners flocked to the annual Petersen Enzo Ferrari Birthday Cruise-In. Few people have influenced motorsports and captivated automotive enthusiasts to the degree of “Il Commendatore” Enzo Ferrari. Although the skies threatened rain, enthusiastic owners came out in a massive assembly of classic and contemporary Ferraris, with a few special editions mixed in. Due to the light rain over the night before the event, some people were obliged to leave the their classics in the garage and bring out their modern carbon rides. This made for an awesome symphony of V-6s and V-8s revving in the parking lot and shooting flames for all to see. Some of the showstoppers included a 430 Scuderia and a 458 Speciale. There were several Testarossas in attendance and one beautiful 400i. The 400i looked a bit out of place in line with the other cars, but the 4 seater coupe could be seen as an investment since resale prices have been steadily climbing as more people become enamored with the brand and the innovative design of the V-12 front engine. As the cruise-in began to wind down, many attendees decided to head over to the Revolution de L’Automobile Show, which was held at the Sherwood Country Club in Westlake Village. The event showcased several historic Ferraris, including the Petersen’s own “Henry Ford” Barchetta. Rev Auto, as the show is casually known, was put on by Ferrari Westlake, who displayed a full lineup of current year models for guests to inspect. The Rev Auto concourse also featured items being auctioned for charity. Numerous pieces of music, movie, sport, and auto memorabilia were available, with the proceeds going to the Westlake YMCA, Cornerstone Preschool, and St. Jude the Apostle School. It was truly a good day to be a Ferrari fan, and with the next Ferrari Cruise-In date already set, we can’t wait to see what kinds of incredible cars will be coming out. Our event could not have been held without the support of sponsors like Westlake Ferrari, Michelin, The Auto Gallery, Hagerty Insurance, Engel & Volker, and Gaspar Insurance. The Petersen is currently hosting a Ferrari exhibit entitled “Seeing Red: 70 Years of Ferrari,” on view until April 2018.